Kütahya ([cyˈtahja]) is a city in western Turkey with 237,804 inhabitants (2011 estimate), lying on the Porsuk river, at 969 metres above sea level. It is the capital of Kütahya Province, inhabited by some 564 294 people (2011 estimate). The region of Kütahya has large areas of gentle slopes with agricultural land culminating in high mountain ridges to the north and west. The city's Greek name was Kotyaion, Latinized in Roman times as Cotyaeum. Kütahya is remembered as Cotyaeum during classical times. It later became part of the Roman province of Phrygia Salutaris, but in about 820 became the capital of the new province of Phrygia Salutaris III. Its bishopric thus changed from being a suffragan of Synnada to a metropolitan see, although with only three suffragan sees according to the Notitia Episcopatuum of Byzantine Emperor Leo VI the Wise (886-912), which is dated to around 901-902. According to the 6th-century historian John Malalas, Cyrus of Panopolis, who had been prefect of the city of Constantinople, was sent there as bishop by Emperor Theodosius II (408-50), after four bishops of the city had been killed. Two other sources makes Cyrus bishop of Smyrna instead. The bishopric of Cotyaeum was headed in 431 by Domnius, who was at the Council of Ephesus, and in 451 by Marcianus, who was at the Council of Chalcedon. A source cited by Lequien says that a bishop of Cotyaeum named Eusebius was at the Second Council of Constantinople in 553. Cosmas was at the Third Council of Constantinople in 680–681. Ioannes, a deacon, represented an unnamed bishop of Cotyaeum at the Trullan Council in 692. Bishop Constantinus was at the Second Council of Nicaea in 692, and Bishop Anthimus at the Photian Council of Constantinople (879), No longer a residential bishopric, Cotyaeum is today listed by the Catholic Church as a titular see. Under the reign of Byzantine Emperor Justinian I the town was fortified with a double-line of walls and citadel. In 1071 Cotyaeum (or Kotyaion) fell to the Seljuk Turks and later switched hands, falling successively to the Crusaders, Germiyanids, Timur-Leng (Tamerlane), until finally being incorporated into the Ottoman Empire in 1428. During this time a large number of Christian Armenians settled in Kotyaion/Kütahya, where they came to dominate the tile-making and ceramic ware production. With this, Kütahya emerged as a renowned center for the Ottoman ceramic industry, producing tiles and faience for mosques, churches, and official buildings in places all over the Middle East. It was initially center of Anatolia Eyalet till 1827, when Hüdavendigâr Eyalet was formed. It was later sanjak centre in Hüdavendigâr Vilayet in 1867. It was briefly occupied by troops of Ibrahim Pasha of Egypt in 1833. 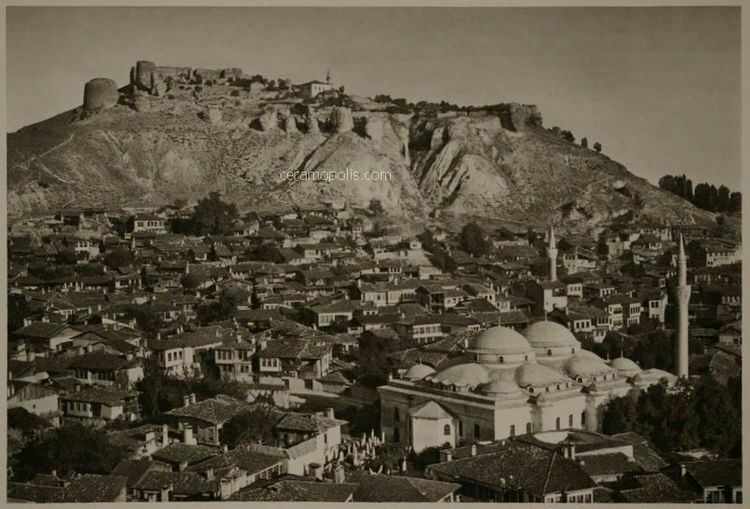 The fortifications of the city and its environs, which were vital to the security and economic prosperity of the region, have been built and rebuilt from antiquity through the Ottoman Period. However, the dates assigned to the many periods of construction and the assessment of the military architecture are open to various interpretations. At the end of the nineteenth century, Kütahya's population was counted at 120,333, of which 4,050 were Greeks, 2,533 Armenians, 754 Catholics, and the remainder Turks and other Muslims. It is noteworthy that Kütahya and the district itself were spared the ravages of the Armenian Genocide of 1915, when the Turkish governor went to extreme lengths to protect the Armenian population from being uprooted and sent away on death marches. Kütahya was occupied by Greek troops on 17 July 1921 after Battle of Kütahya–Eskişehir during Turkish War of Independence and captured in ruins after the Battle of Dumlupınar during the Great Offensive on 30 August 1922. The industries of Kütahya have long traditions, going back to ancient times. Kütahya is famous for its kiln products, such as tiles and pottery, which are glazed and multicoloured. Modern industries are sugar refining, tanning, nitrate processing and different products of meerschaum, which is extracted nearby. The local agricultural industry produces cereals, fruits and sugar beet. In addition stock raising is of much importance. Not far from Kütahya there are important mines extracting lignite. Kütahya is linked by rail and road with Balıkesir 250 km (155 mi) to the west, Konya 450 km (280 mi) to the southeast, Eskişehir 70 km (43 mi) northeast and Ankara 300 km (186 mi) east. A small ewer, now in the British Museum, gave its name to a category of similar blue and white fritware pottery known as 'Abraham of Kütahya ware'. It has an inscription in Armenian script under the glaze on its base stating that it commemorated Abraham of Kütahya with a date of 1510. In 1957 Arthur Lane published an influential article in which he reviewed the history of pottery production in the region and proposed that 'Abraham of Kütahya' ware was produced from 1490 until around 1525, 'Damascus' and 'Golden Horn' ware were produced from 1525 until 1555 and 'Rhodian' ware from around 1555 until the demise of the İznik pottery industry at the beginning of the 18th century. This chronology has been generally accepted. Kütahya has a warm summer continental climate (Köppen climate classification Dsb), with cold and snowy winters and warm and dry summers. Rainfall occurs mostly during the spring and autumn, but can be observed throughout the year. The town preserves some ancient ruins, a Byzantine castle and church. During late centuries Kütahya has been renowned for its Turkish earthenware, of which fine specimens may be seen at the national capital. The Kütahya Museum has a fine collection of arts and cultural artifacts from the area, the house where Hungarian statesman Lajos Kossuth lived in exile between 1850-1851 is preserved as a museum. 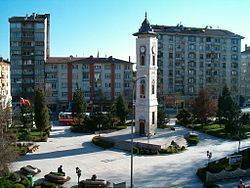 The Main Campus and the Germiyan Campus of the Kütahya Dumlupınar University are located in the city. The main bus station has bus links to most major Turkish cities. Zefer Airport is active. Kastamonu is also the main railroad endpoint for the Aegean region. Evliya Çelebi, Turkish globe traveler and author.